I love, love, love pumpkin! If you don't believe me, just check out my Pinterest boards. I have an entire board just for pumpkin recipes. 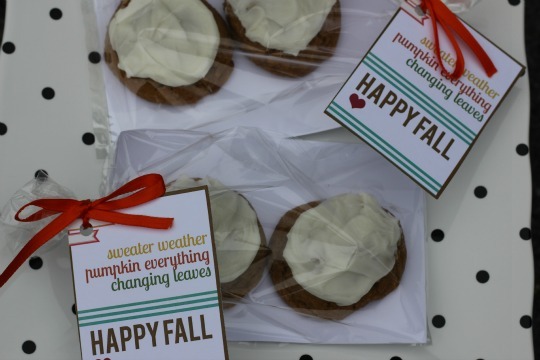 I have to make these cookies at least once every fall. Preheat oven to 350 degrees. Line baking sheets with a Silpat mat or parchment paper. In a large mixing bowl combine flour, baking powder, baking soda, cinnamon, nutmeg, cloves and salt. In another bowl cream together the butter and sugars with an electric mixer. Add pumpkin, egg and vanilla and beat until creamy. Stir in the dry ingredients by hand just until combined, do not over mix. Using a cookie scoop, drop dough onto your baking sheet. Bake for 13-15 minutes. Cool cookies on wire rack. Frost them once they have completely cooled. Beat cream cheese, butter, and vanilla extract in a bowl with an electric mixer until soft and creamy. Beat in confectioners' sugar, about 1/2 cup at a time, until frosting is smooth and creamy. Frost cooled cookies. I love pumpkin too. These look absolutely wonderful!